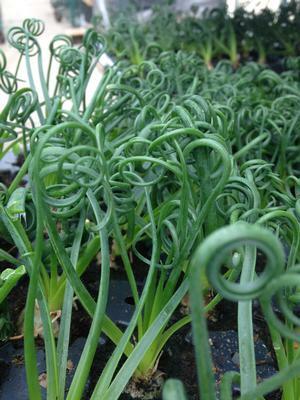 Fast growing bulb that sends up 12-20 long grey-green waxy stems that corkscrew at the ends. This is a fun novelty plant that looks like something from Dr. Seuss. Blooms in late spring with fragrant yellow green nodding blossoms. Some say they smell just like chocolate. Grow it hot and dry, like a succulent, for more corkscrews.